President Mahmoud Ahmadinejad on Monday officially inaugurated an English-language satellite television channel to counter the West's influence in covering news. 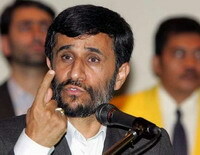 "Press TV should broadcast the truth to the world," said Ahmadinejad in a ceremony marking the inauguration. "This network should be a podium for freedom seekers and Muslims of the world." Mohammad Sarafraz, the deputy head of Iran's broadcasting company in charge of foreign channels, said that more than 3 million people, half of them from the U.S., have visited Press TV's Web site over the past six months. Sarafraz said the 24-hour channel would broadcast news every half hour. He said the channel also plans to broadcast documentaries on American soldiers who quit the military. According to Web site of the channel, the goal of Press TV is to "break the global media stranglehold of Western outlets," and "show the other side of the story" in the Middle East. The channel belongs to Iran's state broadcasting company, the only authorized body in the country to have radio and television channels. The English-speaking network has 30 correspondents around the world, including Washington and New York in the U.S. and the Gaza Strip in Palestine. Press TV said it would be broadcast on several satellites including Hot Bird and Arab Sat. It was not immediately known if an U.S.-based satellite channels planned to show the station.